Wally, meanwhile, is discovering that life as Major’s “guest” isn’t all it promised, especially when he finds out Major’s plans for Ariane’s aunt. With Aunt Phyllis under threat, Ariane has no choice but to walk directly into Rex’s trap - and hope she can find a way to protect both the Shard and those she loves. Grab Lake in the Clouds and prepare to enjoy the adventure! This series has continued to be very entertaining and fun to listen to. The narration, as well, remains quite good. His voice is very engaging. I'm really enjoying where the author is taking the story. I will definitely look for more in this series. 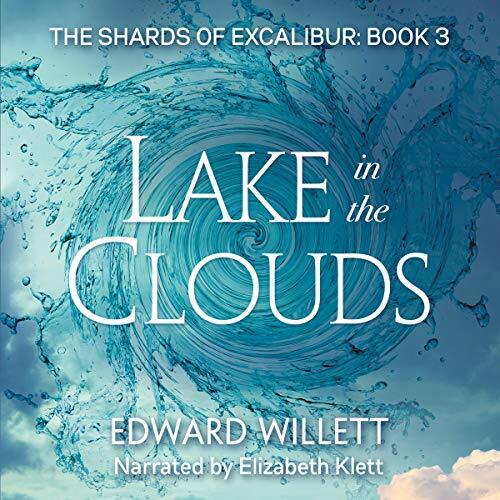 Lake in the Clouds is the 3rd instalment of The Shards of Excalibur. Yes, “THE” Excalibur! This story just keeps getting better and better. I really enjoy that the main setting for the tale is in Canada, focussed in Saskatchewan! Honest. Who would have thought that an enticing Arthurian mystery could originate from Saskatoon? Merlin lives. In the 21st century, he exists under the guise of Rex Major, a powerful and wealthy computer magnate. The door to Faerie is barely open so he only has access to a trickle of magic - but that has been enough to get where he is. But, of course, he wants more. Gathering the shards of Excalibur would give him back most of his former power. However, The Lady of the Lake has passed on her power to one of her descendants, Ariane..… It is her role to thwart his search. Join Merlin, Ariane, and her friend, Wally Knight... as they traverse the globe looking for the pieces of Excalibur. As their adventure continues, several new layers of the mystery are revealed. Is Wally KNIGHT just a random kid who happened to be near when Ariane met the Lady of the Lake? Why did the Lady include Wally in the quest? Why does Merlin feel the need to have the young Knight on his side? We learn much; but, many new questions arise. I’m ready to listen to Book 4. Once again, Elizabeth Klett does a fantastic job narrating the story. Her accents are spot on, an enjoyable listen. I received this audiobook, at my request, in exchange for an honest review. For me, this story was a very satisfying follow-on to book 2 in the series. Wally plays a much larger part in this one, something which I very much welcomed. His internal struggles as he tries to balance his worry for Ariane against his growing suspicions about Rex Major's real plans for her and himself really helped to flesh out this character for me. It made the race to find the next shard that much more interesting. After the frustration of all the conflict between him and Ariane in the previous book, I was relieved to see this book make the shift towards understanding ... even if it takes nearly the whole adventure to get them there. I also really enjoyed the way Mr. Willett uses humor - mostly at Wally's expense - in getting the two teens back to working together again. Ms. Klett's narration is, as usual, superb. I cannot overstate how well she handles the voices of all the characters; at no point is there any confusion as to who is speaking, and both male and female characters are voiced equally well. Travel to another great far-away destination, outsmarting the villain, unexpected character revelations, and a couple of really good plot twists all contribute to making the 6 plus hours of this story just fly by. I can't wait to hear what happens next! The story moved along at a fast pace and kept me wanting to listen more. The narrator's engaging, soothing voice made it east to listen for hours, which was a good thing, because I didn't want to stop. I am loving this series! This is Book 3 in the series, The Shards of Excalibur. So much intrigue, adventure, danger, it's a very fun listen! Will the dastardly Rex Major win? What will be come of Wally and Ariane and her aunt? What about the third Shard? Find out and listen, you'll be happy you did. Excellent writing and narration really bring this story to another level. It's awesome! This is the third book I’ve read/listened to by this author. I’ve listened to the other two books in this series. Ariane, having done something to make Wally question her control of the powers, feels betrayed he seems to side with Rex Major (Merlin). Learning more things she can do with the power of the Lady of the Lake, Arianne also starts to understand what these powers might be doing to her. Wally, willingly goes with Rex Major in the beginning, but his initial doubts about Rex major start to resurface. Aunt Phyllis, who continues to be supportive of the kids, is in danger after a run-in with Rex Major. Ariane needs to get to New Zealand to find the next shard, but to do so she has to cooperate with Rex Major. This is the thirteenth book (she does great narrating several trilogies by Sara Noffke) I’ve listened to by Elizabeth Klett. She maintains her high standard with this book as well. When she narrates I forget that I am not a part of the story, I am being read to.